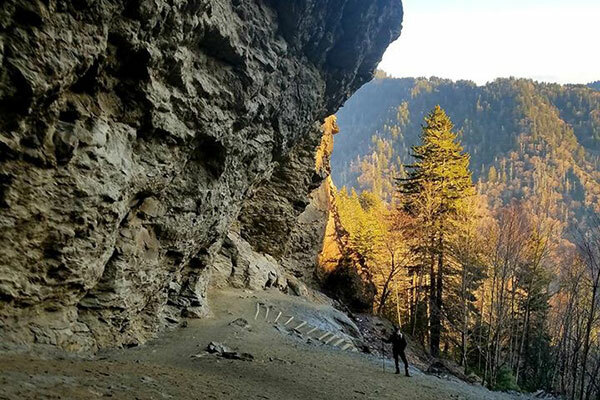 If you are looking for a hike that is rich with history, jaw-dropping panoramic views and geological anomalies, look no further than the trail to Mount LeConte via Alum Cave. In a recent post, we covered all of the basics of the Alum Cave trail. If you are wanting to summit Mt. LeConte, you will need to hike 2.3 miles to Alum Cave and continue on the trail for approximately 5.5 miles. The hike to Mt. 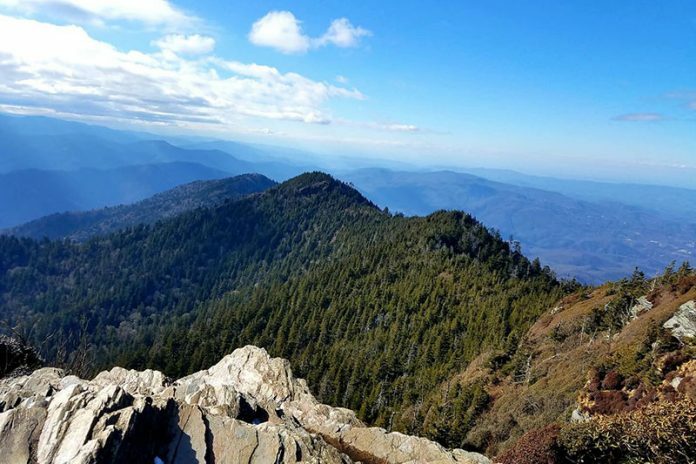 LeConte is one of the most popular hikes in the Smokies, and though it may sounds strenuous, it is not technically challenging and can be completed by anyone who is in generally good shape. The hike to Mt. LeConte is on many national park visitors’ bucket list, and it’s easy to see why. Between the stunning panoramic views, the steep elevation gain in only 5.5 miles, and the opportunity to spend some time relaxing at the infamous LeConte Lodge before you reach the summit, there wonders on this hike are endless. While hiking on the Alum Cave Trail, you will see signs for Mt. LeConte. Even if your goal is to summit LeConte, make sure you take time to enjoy all of the sights and scenery the Alum Cave trail has to offer. This particular trail has many unique features, like Arch Rock and the cave itself. At roughly 2.6 miles from the Alum Cave Trailhead, you will approach a landmark named Gracie’s Pulpit. This rocky promontory is a very short side trail and is named after Gracie McNicol. Gracie overcame many personal hardships, including a broken back, and climbed Mt. 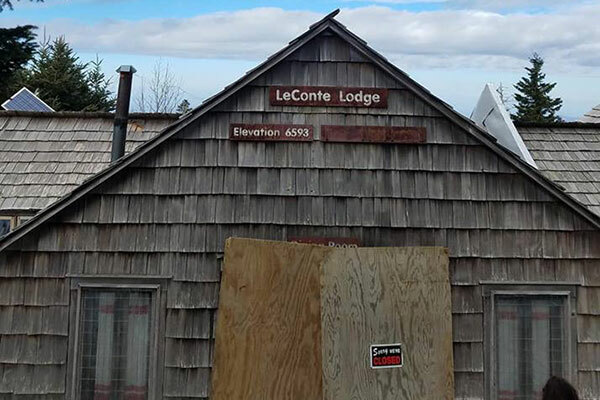 LeConte a record 244 times. Be warned that this particular spot is where some hikers choose to “relieve” themselves while on trail, but on the upside, should you choose to enjoy this bluff, you are at the halfway point to Mt. LeConte. As the trail continues, there are many spots where cable handrails have been installed to assist hikers. I took advantage of all of them, as the gravel on the ground was slick, as per usual, both times I hiked this particular trail. Hikers should note that in the areas where the handrails have been installed, there are steep drop offs on the opposite side of the trail. 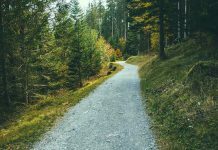 Hikers should also be made aware that during winter months, these sections of the trail are typically frozen, so proper footwear is very important. While it may sound intimidating, overall, these ledges do not present any challenges, unless you are afraid of heights. After you’ve completed this section of the trail, the terrain begins to flatten out a bit as you pass through a spruce-fir forest. As you could imagine, seeing land on all sides of you after hiking through a couple miles of intense inclines coupled with steep drop-offs, is one of the most comforting and welcoming sights on the trail. On the other side of this section of dense forest, you will be met with a sign for Rainbow Falls, LeConte Lodge, or the LeConte Summit. You will want to keep right and continue on the trail for a short distance. At this junction, we saw some of the lodge staff doing trail maintenance. On your left will be a short trail that leads you to LeConte Lodge. Should you choose to take a break here, there are most often always friendly hikers there to greet you, take your photo in front of the lodge, and answer any questions you may have. We decided to have a quick snack break before continuing on to the summit. The Mt. LeConte Summit is another half mile from the lodge. On your way to the top, you will be met with a couple side trails that offer panoramic views. At 0.2 miles past LeConte Lodge, you can turn right and check out Cliff Top, which is the best location for sunset views. At 5.2 miles, Trillium Gap Trail will be on your left. This 13.9 mile round trip trail is another option for hikers hoping to reach Mt. LeConte, or for some hikers, it’s a new adventure and a path back down the mountain. At the 5.5 mile mark, you will have reached the summit, or High Top. You will know you have reached it by the pile of rocks just off the main trail to your right. Once you’ve made it, take some time to relish in your accomplishment. You just successfully hiked to the third highest peak in the Smoky Mountains National Park, as well as the highest peak in Tennessee. Mt. LeConte was measured in the 1850s, but it wasn’t until the 1920s, when Paul Adams moved to Knoxville, Tennessee, that activity began to take place on the mountain. Adams was an enthusiastic hiker and adventurer and spent most of his time outdoors. In 1924, he joined the Great Smoky Mountains Conservation Association, a group that played a major role in making the region a national park. In order to show Washington dignitaries the beauty that the rugged land held, he led an expedition up Mt. LeConte. During the expedition, they camped in a large tent, which later became a cabin and is now LeConte Lodge. LeConte Lodge is the highest guest lodge in the eastern United States and is a must see for anyone venturing up the mountain. Established in 1925 as a single cabin, it has bloomed into a series of smaller cabins where guests can stay for a fee. You can find more information about making reservations on the official LeConte Lodge website. While it’s is not certain who exactly Mt. LeConte is named after, the United States Geological Survey lists famous geologist, Joseph Le Conte, as the man for whom the mountain is named. More recently, local authorities have challenged this and said that the mountain is named after his less famous physicist brother, John Le Conte. Who Will Enjoy This Hike? As stated above, this hike is strenuous going up and down. This particular trail is not wheelchair or stroller friendly. While it is possible to complete this hike to the summit with small children, I would not recommend it, simply due to the steep drop-offs you encounter. While you could carry small children for the duration of this hike, it could limit your own personal mobility. Children who can walk the full 11.0 mile hike and back should be more than capable of completing this trail. While the first section of the Alum Cave trail may seem like it’s a breeze with its beaten path, the trail’s level of difficulty and intensity quickly increase as stairs, bridges, drop-offs and steep inclines are introduced. 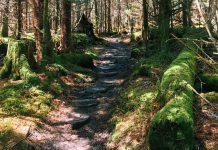 This is a great trail for anyone seeking adventure and wanting to get a taste of what hiking in the Smokies is truly all about. Hikers should plan to spend anywhere from 6-10 hours on this hike. As with most day hikes, you’ll want to make sure you’ve packed all of the essentials in your backpack. 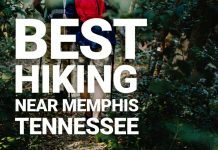 Depending on the season, you will need to adjust your gear for this hike. In the spring and summer, you’ll make to make sure you have a raincoat with you, just in case you get caught in a thunderstorm. It’s also worth noting that weather at higher elevations is often unpredictable. The LeConte Lodge Twitter is a great resource for checking the weather before your hike. If you’re planning to hike during winter months, you’ll definitely need microspikes. A lot of hikers recommend using trekking poles year round on this trail as well, due to the steep decline on your way back down. You’ll also want to make sure you pack plenty of energy fueling snacks. We took two “meal” breaks on our trip – one at the cave and one at LeConte Lodge. LeConte Lodge also has lunch sacks available for purchase from 12:00 – 5:00. When planning your trip, keep in mind that LeConte Lodge does close for the winter in November. When selecting footwear for this hike, make sure you choose something that is both comfortable and has great traction for walking over slippery rocks. You might also notice water dripping from Alum Cave. In the winter, this precipitation can transform into 2-3 foot long icicles and may pose a risk during your hike. Because LeConte Lodge cannot be accessed from the road, LeConte Lodge staff members will have items delivered via alpaca to the lodge. Many hikers have reported seeing the alpacas on the trail and sometimes at the lodge. Wildlife is also frequently spotted on this trail. On our second trip to LeConte, a hiker stopped and told us other hikers had spotted a bear along the first section of the trail. We did not see a bear, but we saw plenty of mice. Either way, it’s always best to be aware of your surroundings and know what to do if you come in contact with a black bear. The hike to Mt. LeConte is one that can be completed year round, with the right gear, and is definitely one that should be on your Smokies bucket list.